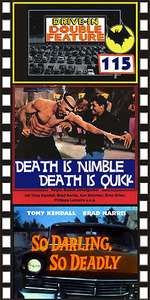 DEATH IS NIMBLE, DEATH IS QUICK (1967) Tony Kendall, Brad Harris, Ann Smyrner. Tony and Brad protect a lady who’s a kidnap target in this thriller that has a bit of everything: sci-fi, ancient temples, martial arts, big explosions, jungle thrills, etc. Watch for Harris’ karate death-duel in a crumbling temple encircled by masked members of an ancient sect. Wow! Color, 16mm. Plus: SO DARLING, SO DEADLY (1967) Tony Kendall, Brad Harris, Barbara Frey. Tony and Brad protect a scientist and his amazing power beam that can destroy targets 300 miles away! The mysterious Golden Dragon and his machine-gun and whip wielding babes try to steal the power beam. There’s a cool torture chamber that Tony and Brad get trapped in! A top ‘60s spy/sci-fi film with lots of great action scenes, a dash of humor, and a sinister oriental flavor. Nice color, from 16mm.